Toughened Roof pane shattered after film install. 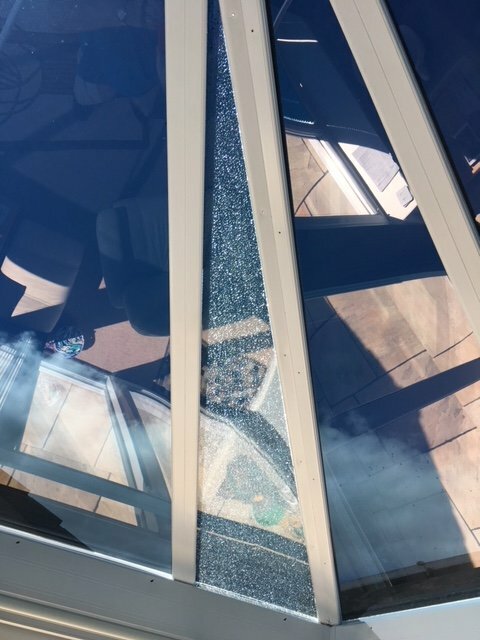 2 weeks after installing a 5% True Vue film from SG on a conservatory roof with tempered glass one of the panes shattered (See pic). From my experience and knowledge it should not be the film that has caused this and my SG consultant has stated it could not be the film, but as the client says I was the last person to touch the glass they are holding me responsible. Any ideas what to say to customer ? I would agree with the fact it wasn't the film. If for no other reason, TV5 is fairly reflective, and even if that weren't the case - say you put up blackout film - tempered glass should be able to take any amount of heat a film would absorb. Not exactly what I would tell a customer - other then probably eating the cost to have it replaced. Nickel-sulfide inclusion ... Google it and present findings to person in charge.